Today I conclude my packaging frenzy with a new release of ‘liveslak‘. Version 1.1.4 is ready with only some minor tweaks. Users of the “iso2usb.sh” script on non-Slackware distros should be happy that the script finds all the required programs now. I made a set of ISO images for several variants of the 64bit version of Slackware Live Edition based on liveslak 1.1.4 and using Slackware-current dated “Fri Nov 4 03:31:38 UTC 2016”. These ISO images have been uploaded and are available on the primary server ‘bear‘. You will find ISO images for a full Slackware, Plasma5 and MATE variants and the 700MB small XFCE variant. The new ISOs are based on the latest slackware-current with Linux kernel 4.4.29. The SLACKWARE variant contains exactly that: the latest slackware-current and nothing else. The MATE variant (a Slackware OS with KDE 4 replaced by Mate) has a refreshed ‘msb‘ package content, I synced my local ‘msb‘ mirror with the official package repository at http://slackware.uk/msb/current/ which means you get Mate 1.16, the GTK3 version. 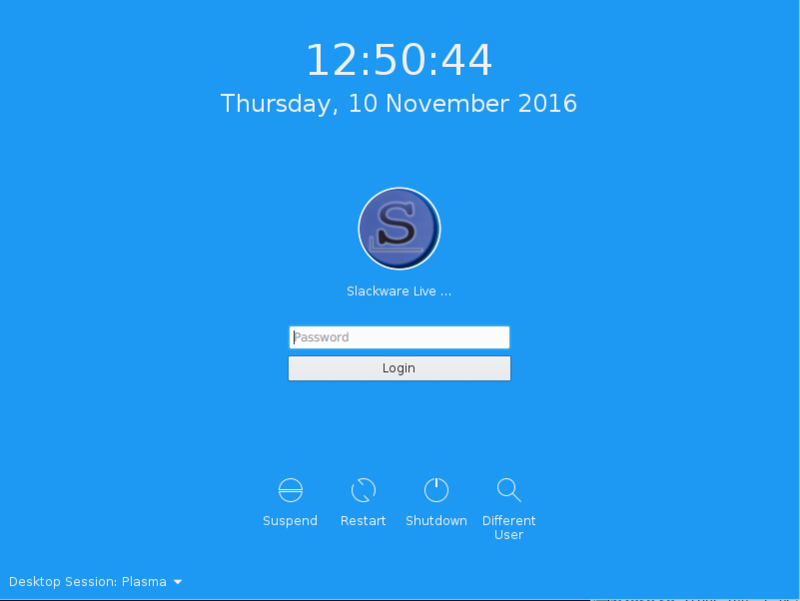 The PLASMA5 variant (Slackware with KDE 4 replaced by Plasma 5) comes with the latest Plasma 5 release “KDE-5_16.11” as found in my ktown repository. This ISO also contains the LXQT and Lumina Desktop Environments. Both are light-weight DE’s based on Qt5 so they look nice & shiny. 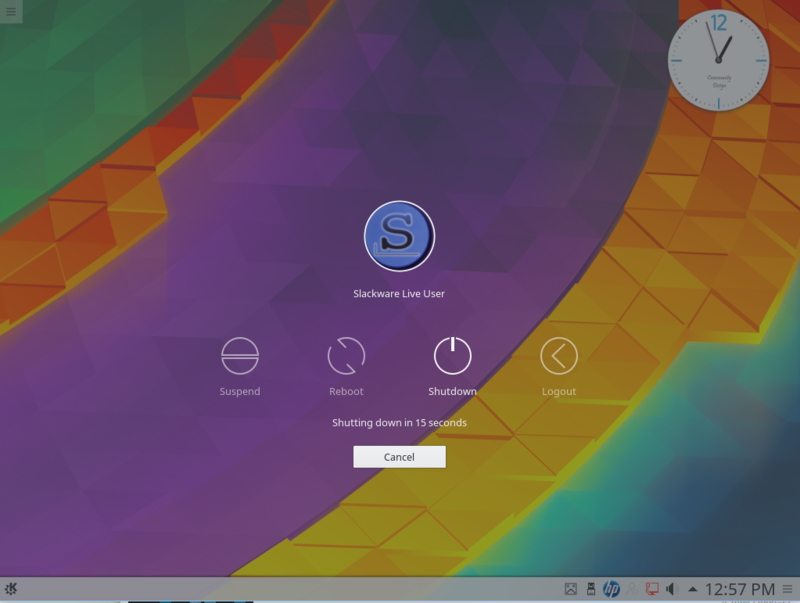 The Plasma 5 packages inside the ISO already satisfy most if not all of their dependencies. Let me know what you think of Lumina and LXQT! The ‘1.1.4’ tag was mainly applied to accompany the release of the new ISOs. iso2usb.sh: get rid of hard-coded program pathnames in favor of searching a hard-coded $PATH . This should improve the usefulness of the script on non-Slackware distros. make_slackware_live.conf: make the filename ‘min.lst’ customizable for Live distro developers. PLASMA5: use the ‘latest’ instead of the ‘testing’ repository. Hey Eric, thanks for doing this! I see that there are options in iso2usb.sh for persistent files and encrypted home directory which is a nice feature. The documentation even suggests that we can use this on FAT files systems so that the thumb drive works as a normal thumb drive on other OS’s which is great, but I can’t figure out how to tell iso2usb.sh to make a fat file system. It always stomps everything and creates a new partition table. Is there a switch I’m missing or something? Matthew, the iso2usb.sh script will always create or modify a specifically formatted USB stick consisting of 3 partitions with partition #3 being the Linux partition where all the OS files will be copied. The documentation mentions that Slackware Live Edition is able to be copied onto a stick with just a FAT partition, but if you want that, you have to copy files to the USB stick and make it bootable manually. I have not written a script which does all of that for you. I may never write such a script. However, the required manual actions are not difficult. They are just not trivial and you have to know a bit about how the Live OS works. Just to say : thank you. Am downloading. comments may follow. I just used “setup2hd” to install the PLASMA5 edition to my new ThinkPad. I realized that I still need to patch eliloconfig because that is not flexible enough to work with the different mount point (/setup2hd instead of /mnt) which is used for installing Slackware in the Live envronment. But with some manual copying of files from /boot/efi to the EFI system partition, I was finally able to boot this ThinkPad into (first Lumina to check that out, and then) Plasma 5. Thank you very much for all your work here. Your packages are one big reason for me to keep using slackware. Do you plan on updating your LXQT and Lumina slackbuilds to their last releases soon? Anyway, thanks again and congrats for your new job! Sergi, my Lumina package is already at the most recent version (1.1.0-p1). I will probably build packages for LXQT 0.11.0 when I prepare for the new KDE ‘ktown’ release somewhere in December. LXQT is a chaotic project which I think is not trivial to build when they have a new release (too many incoherent packages from multiple sources). So it is not something I can do routinely. Actually, my statement about Lumina was incorrect. I have included lumina-1.1.0.p1 in my Slackware Live Plasma edition, but had not uploaded the package to my regular repository. In order to make amends, I am not only going to upload lumina-1.1.0.p1 in a few minutes, but also the latest LXQT 0.11.0 release which I just built for Slackware 14.2 and -current. Take note of the LXQT dependency list! You can find all about the deps in the file README.Slackware. thank you. posting from the live OS. everything running smooth and fast. I installed slackware kde 5 plasma from the latest live dvd. The entire installation with the setup2hd utility has run without errors. When rebooting and booting from the hd I can not use the laptop keyboard. I’m surprised. What can it be? Carles, I am surprised too. The setup2hd script installs the “huge” kernel which should boot the system properly. If you have not configured LVM, RAID or LUKS then the system should have working keyboard by the time it is ready for you to login. If you configured the machine to use the “generic” kernel instead, then you will have to create an initrd yourself to go with it. For instance, if you encrypted your harddrive using LUKS, the keyboard support modules must be added to the initrd in order to allow you to enter a passphrase in the early boot phase. I sincerely appreciate the information you have given me. I started with the live dvd and after mounting the root partition I followed these instructions, cp /usr/share/X11/xorg.conf.d/90-keyboard-layout.conf /etc/X11/xorg.conf.d/, I changed initdefault to 3 and proceeded to create the nonprivileged user (forget to create it). Resolved. Thanks again. If I’d install it to the HDD – how can i update it afterwards? Carles, Slackware Live Edition comes in several variants. Apparently you installed the PLASMA5 variant, but probably Janis has installed the SLACKWARE variant which is just an out-of-the-box Slackware with KDE 4. Janis. upgrading a slackware-current is always the same process, it does not matter whether you installed it from the Live ISO or from a regular installation DVD. If Slackware moves from KDE 4 to Plasma 5 oficially, your system will upgrade itself too. In the meantime, many KDE 4 applications are still available. If you are not confident about using KDE 4, just move on and install Plasma 5. When we going to be able to download a Slackware 14.2 Cinnamon DE Live ISO? Probably never. I added Cinnamon as one of the Desktop Environments that can be made into a Live ISO but I am not going to actually host those ISO images. You can create one yourself of course. Hello friends, My kde 5.8.3 is ready, very stable ! 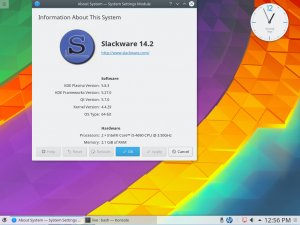 !Can I upgrade my Slackware 14.2 current, KDE 5.8.3? My update wants to download kde4! Sorry, I’m noob. zappalaus – I assume that you are using slackpkg to upgrade. The slackpkg tool works with official Slackware packages, so when you have my Plasma5 packages, it will ignore those and wants to try to replace them with official Slackware (KDE4) packages of the same name. You have two options: the first is to blacklist all my packages in /etc/slackpkg/blacklist, and the second is to start using the extension called “slackpkg+” which will enhance slackpkg so that it can work with 3rd party repositories like mine, and (in your case) give priority to packages from the Plasma5 repository. Well yes that is correct. What you currently have installed (elogin and friends) was part of a one-shot testing release of Plasma 5 where I wanted to add Wayland support. That did not turn out well (I could not get Wayland to work) so the next Plasma 5 releases are again regular releases that do not add elogind (a systemd component) and do not come with recompiled Slackware (mesa and xorg-server) packages to give them Wayland support. So apart from removing elogind, your upgrade command should also revert your mesa and xorg-server packages to the regular Slackware versions. The plasma-mediacenter package is no longer part of Plasma5. And sshfs-fuse is now part of Slackware itself, so it is no longer part of my own repository for Slackware 14.2 and -current. Please read the various READMEs and ChangeLogs more carefully if you are running -current. All of the above was documented. Using slackware-current means that you must never blindly rely on package automation tools. Problem solved, posting here and atKDE15.16.11. Problem with screen blank was resolved when ~/.config/autostart was renamed to autostart-old and KDE no longer was trying to load a bad acting widget or startup program. See other blog thread for more detail. Hi Eric, thank you for the great Live distro, really! Finally I have a full-working out of the box live distro based on Slackware for my HP Spectre x360. Now I have a question: is there a way to login at the boot as root user? Thanks! kalo86, the root user has password “root”.